Knitting Rules and Qiviet Drools! What’s more “drool-able” than Qiviet? Well, how about qiviet spun with silk? Now this is something to write home about. My home. Better yet, don’t write about it, just send some. I’ll be your best friend forever! Anyway…. this is what Knit Purl Girl says: A truly decadent blend of qiviuk and mulberry silk, this unbelievably luscious yarn is a treat to the senses. 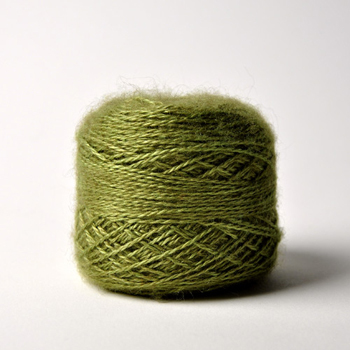 Sublimely soft, the yarn features a glowing silk core and fuzzy qiviuk halo. Ideal for light-as-a-feather pieces that will be toasty in subzero temperatures, this amazing yarn is a practical indulgence for winter. This “sink your teeth into it” stuff is available in 5 luscious colors, and you can find it by clicking over to KnitPurl.com!